Quest Vitamin C is a potent antioxidant which helps protect tissue against the potentially damaging effects of free radicals. It is required for the production of collagen, the most abundant protein in the body, to healthily form skin, hair and nails. Vitamin C supplements are chosen to support the immune system. Vitamin C is water soluble and needs to be continuously replaced. Why use Quest Vitamin C? Take a look at our Quest Platinum Biotix and Quest Omega 3 Fish Oil to find out more about the benefits Quest Excellence products have to offer. Vitamin C (Ascorbic Acid, hypromellose), Citrus Bioflavonoids Complex (Citrus Powder, Calcium Sulphate, Cellulose, Stearic Acid, Magnesium Stearate, Guar Gum), Bulking agent: Microcrystalline Cellulose, Magnesium Stearate, Anti-caking agent: Silicon Dioxide, Glazing agent: hypromellosecellulose. Take one to three tablets daily with a meal. Swallow with water. Intakes above 1000mg of Vitamin C may cause slight stomach upset in sensitive individuals. Individuals predisposed to oxalate kidney stone formation should avoid high dose vitamin C supplementation. Individuals on anticoagulants should limit their intake to 1g/day. Below are reviews of Vitamin C 500mg - Quick Release Formula - 60 Tablets by bodykind customers. If you have tried this product we'd love to hear what you think so please leave a review. 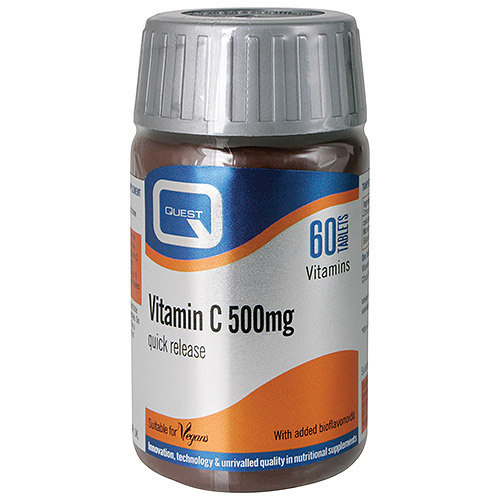 Quest Vitamin C 500mg is a quick release Vitamin C supplement, designed to release nutrients within 30 minutes. Vitamin C is a potent antioxidant which helps protect tissue against the potentially damaging effects of free radicals.